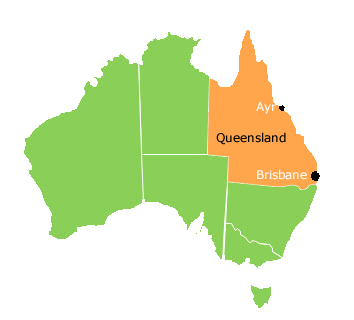 Ayr is a prosperous medium sized country town approximately 88kms South of Townsville in North Queensland (about 1150 km north of Brisbane). We are on the Bruce Highway and are also accessible by Greyhound and Premier Coachlines and State Rail. We have a huge Italian farming community with a wonderful town spirit.